The sun was (finally) shining Sunday morning as I stepped out of my family's new-to-us camper trailer that we had set up in my father's backyard. 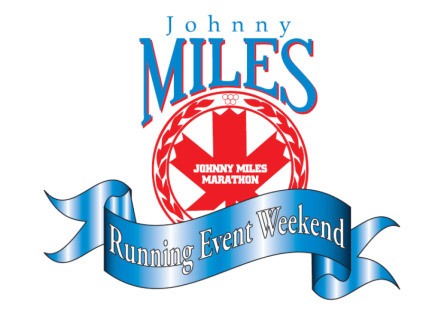 I was back in my old home town of Pictou, only a few kilometers from the beautiful town of New Glasgow where the Johnny Miles races would begin in a couple of hours. I got my daughter set up inside my father's house, happily crunching at froot loops as my husband Richard and I pinned on our bibs and brushed our teeth. We managed to score a parking spot less than three blocks from the start line and quickly found what was left of the complimentary breakfast on the main street. The event had sold out so 4000+ people and their families filled the otherwise sleepy main street of New Glasgow in eager anticipation. Music boomed and runners adjusted their fuel belts, laces and hats, some people looked around nervously, others with determination. Richard and I bumped into a friend who was running her first 10km race and wished her luck as she joined the porta-potty line. We stood around in the shade, waiting patiently for the 10km race to begin. The Johnny Miles started the marathon runners first, the the 5k starting just 5 minutes after, then the half and 10k runners together, 5 minutes after the 5k runners. Even with the short start intervals there didn't seem to be any issues, everyone was very respectful and there seemed to be very little pushing in the narrow downtown streets. One gentleman, who was celebrating his 99th birthday (! ), was walking the 5k race with a huge support crew of family. They all wore green "99 club" shirts as the walked en mass. The course itself had to be changed this year as there was road construction. This year we would go through the north end of New Glasgow, then into Abercrombie, then to Trenton and back to New Glasgow in one large rolling hill loop.